The US Congress demanded to arrest the security service of Turkish President Recep Tayyip Erdogan for a fight with the demonstrators. 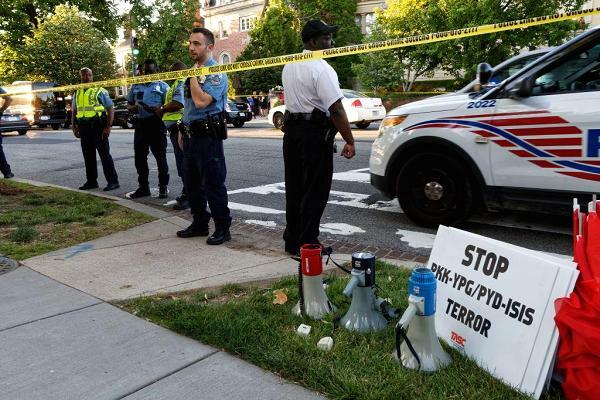 Washington Mayor Muriel Bowser and city police chief Peter Newsham announced that the police issued warrants for the arrest of Erdogan's guards who participated in clashes with protesters. After that, the Turkish president promised to fight against the US decision by political and legal means. How could it happen that in the capital of a world powerfamous for its police brutality the demonstrators were so close to the leader of a foreign power that his bodyguards were forced to fight? Then, instead of apologizing for an undesirable incident, US politicians pass a resolution condemning the security service of the foreign president and threatening him with consequences. Moreover, the congressmen demand that the State Department withdraw diplomatic immunity from the employees of Turkish special services who participated in the incident, and the mayor of the city together with the sheriff issue a warrant for the arrest of foreign citizens. The events that caused the current crisis - the crisis between the US and Turkey - can already be said, occurred on May 16. On that day, near the residence of the Turkish Ambassador to the United States, where Erdogan was, opponents of the Turkish leader staged protests. Then, the protests escalated into a short, but furious clash between the demonstrators and Erdogan's guards. According to the US authorities, nine people were injured. At the same time, according to the American media, Erdogan "personally watched how his guards beating up protesters." Further, the State Department called the Turkish ambassador to the carpet. Ankara responded in the same way. Further, Congress entered into a squabble. Turkey said that the decision to issue warrants for the arrest of Erdogan's guards is "biased and has no legal basis." According to the Turkish side, "if the US adopted standard security measures, as it usually happens during visits of such a high level, then this incident would not have occurred." The answer to this question is simple. In this case, as in a drop of water, all the instincts and all the complexes of present-day America are reflected. Today, the US is losing the position of a global hegemon. Other countries cease to act like stupid puppets. Russia does not sag under sanctions, the Russian army does what it wants without showing any apprehension over the indomitable power of the armed forces of America. China is also doing its work stubbornly, and even dares to replace the US in the role of world's globalizer. And here arrives the Turkish president, who is benevolent with Russia, who needs to be taught a lesson. But do the American authorities understand possible consequences?